I got home from the ALA conference in DC last Wednesday afternoon and I have yet to fully unpack my suitcase — only the essentials have been removed and a few other items. In fact, it is unlikely that it will be fully unpacked until this coming Wednesday when I have the day off for the 4th of July. This was really bugging me this morning as I like to feel organized and on top of everything. In my defense, I got off the train last Wednesday at 2 pm and was in the library by 5 pm to work the closing shift. I also chose to spend Thursday and Friday evening having fun with my son instead of doing laundry. What happened during the weekend you ask? 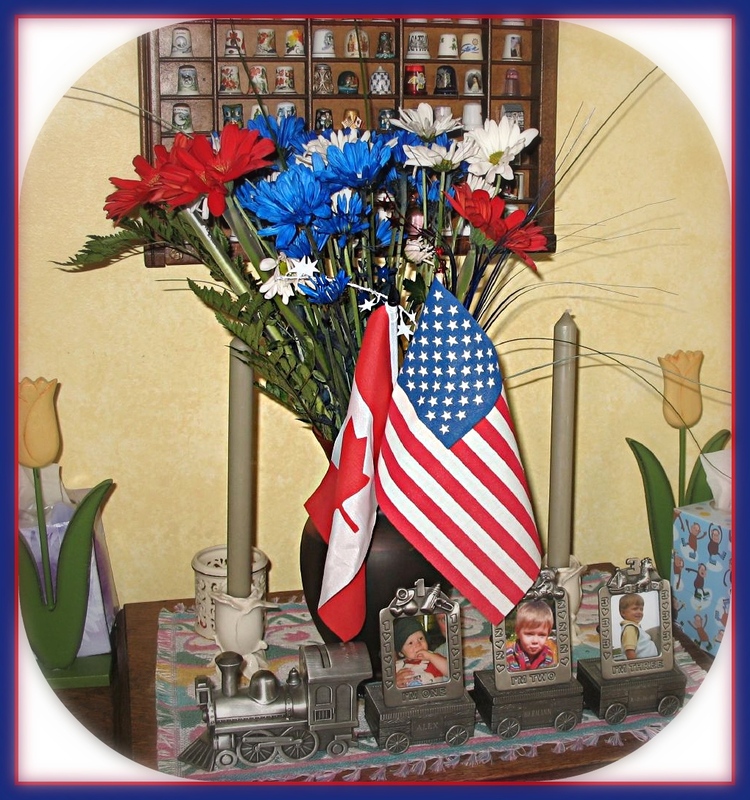 We had a huge BBQ bash on Sunday in honour of Canada Day, so I spent Saturday cleaning house and grocery shopping (and having Alex help me make patriotic cookies and the special bouquet pictured here). Hence the suitcase got ignored once again. As I dug around in my suitcase this morning trying to find my favourite black sandals (they were on the bottom, of course) I felt really down on myself for having been home nearly 5 days and still having an almost untouched suitcase on the bedroom floor… not to mention a tote bag full of flair in the family room that still needs sorting and distributing. But then I remembered the look of joy on Alex’s face as he played with his friends at the BBQ yesterday and I felt a bit better about my state of disorganization this morning. I am often asked how I “do it all”, a question that I am never certain how to answer. Some days I feel like I really can do it all and other days I feel like I am an imposter only pretending to really have it all together. Today is an imposter day, so I am posting this as insight in to the fact that I don’t always manage to do it all and sometimes I have to choose between having clean clothes and enjoying time with family and friends. Note: I edited the title after the caffeine kicked in. My original title of “Working Mom” is not meant to implicate that SAHMs don’t work hard, as I know many SAHMs that work very hard. WOHM is much better term. Tootling one’s own horn	Email Woes … and the answer to my woes?